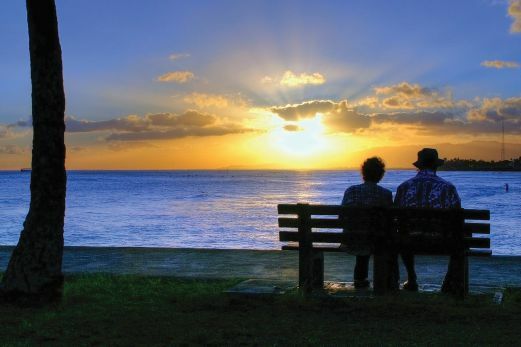 When you are old, spend as much time as possible with your other half. One of you will most likely leave first and the one left behind will only have memories to cherish. On one of my weekend drives to nowhere around this beautiful country, I stopped one late afternoon at a roadside stall somewhere deep inside central Pahang. What was planned as just a stop to wet my dry throat turned into another lesson in life. The stall was manned by a frail old lady who moved about with the help of a rattan walking stick. As she was preparing the drink I asked for, I looked around and saw a small house behind the stall where she lived. There was a bench overlooking a pond next to the house where I pictured she would sit every evening to watch the day’s last lights. As she handed me my cup of tea that afternoon, I saw she had prepared one for herself and so invited her to sit with me. She came over and we talked. Many years ago she and her then young husband came to a Felda land scheme not far from the place but left to start the food stall after the last of her three children made it through school and later left for the bright lights of Kuala Lumpur, and when she and her husband could no longer afford the hard work in the oil palm plantation. They started the food stall but her husband died several years later of a kidney ailment. Since then, the old lady has been accompanied only by her beloved orange cat which that afternoon that we shared the table, laid fast asleep on the floor. As she looked towards the road over the rim of her teacup, the old lady reminisced about her younger days, how she and her husband toiled the land to put their children to school so they would never have to go through the hardship their parents went through and that they would have a brighter future. Her children come to visit sometimes although she said she did not expect them to. “They have their own lives and children of their own now. And besides, they call me quite often,” she said. The stall keeps her occupied during the day as lorry drivers on their long distance journeys along the Kuantan-­Segamat route break their journey there. But as the place was otherwise isolated, I wondered whether she was afraid during the nights. That was when she became rather philosophical, telling me that one must not complain too much about what life throws at us. “One day I will leave too. And if it is fated that this must be where it will all end, then I am more than ready. I have lived a fulfilling life. We had nothing when we arrived at the land scheme. All that we ever wanted then was to send our children to school. They returned our efforts by all of them going to university in the end. My husband and I were so happy,” she said. When they first opened the food stall, friends from the land scheme frequented the place and they enjoyed talking about their younger days in the plantation. But since then many of them have either passed on or had become too old to make their way to her place. When the time came for me to continue my journey, I said goodbye to her and wished her the best. She reminded me to drive carefully and to stop there if ever I’d pass that way again. As I looked into the rearview mirror before turning back onto the road south, I saw her bending down to pick up what by then was the love of her life, her orange cat. A few weeks later, a friend who was also an avid traveller forwarded me a video clip. It was about getting old. In the clip were several reminders about the inevitable and how as mere mortals one may prepare for the evening years. I share with you here what was in the video clip which was simply titled “when you are old”. WHEN you are old, spend as much time as possible with your other half. Remember, one of you will most likely leave first and the one left behind will only have memories to cherish. WHEN you are old, there will come a time when even getting to your front door will be a challenge. So, while you still can, visit as many places as possible. WHEN you are old, stop worrying about your children. They will make their own fortunes. Just make sure you have settled all your dues before you go so they will not have to bear any and that you will be able to leave without regret. WHEN you are old, seize every opportunity to be with old friends, former classmates and former colleagues. There will be fewer such opportunities as time goes by. Running water does not flow back and so it is with life. WHEN you are old, treat sickness with optimism. Whether you’re rich or poor, everyone goes through the process of birth, aging, sickness and death. There are no exceptions. That is life. The video clip brought my mind back to the old lady at the food stall as there were some things in the video clip that were like those that she told me that afternoon we met. I could not help but felt thankful that even in her modest self and in that place in the middle of nowhere, lessons were aplenty. The writer is the newspaper‘s group editor. The profession has taken him to all corners of the globe.